McClelland and Stewart, 1973-01-01. Hardcover. Used:Good. U.S.A.: Douglas & McIntyre, 2003. pp.174 clean tight copy inscribed on title page. Inscribed By Author. First Douglas & McIntyre Edition. Soft Cover. Near Fine. 8vo - over 7¾" - 9¾" tall. New York: Alfred A. Knopf, 1974. By raft down the Yukon with his wife and six children, Pierre Berton retraces the great wilderness route of the 1898 goldrush to the ghost town of Dawson - his childhood home. 174 pp. plus Drifting Home An Album. Burgundy cloth covered boards have gilt text on spine and front, Knopf colophon blind stamped on rear, top edge dyed, map of route ep's. Unclipped ($7.95), photographic, wraparound DJ has bit of edge wear at spine ends, ow , i t too is as new. Book is from the collection of Toronto author/poet and frequent Harbourfront literary event host, Greg Gatenby. His signature and the year of this book's acquisition are found ffep. Author's signature and date, Sep 89 in blue ink are found on title page. SIGNED by AUTHOR. Bookseller's Inventory # 133321. . Signed by Author. Stated First Amrican Edition. Burgundy Cloth. As New/Fine. 8" X 6 ". Toronto: McClelland & Stewart Limited, 1973. Yellow cloth covered boards with title blind stamped to front and gilt titling to spine. Map of the Yukon Territory and the Pelly Mountains to the front and back paste downs and end papers. Clean, clear text; 174 pages plus 24 full page color photographs by Robert Holmes. Jacket rubbed at corners and with a few small closed tears to the spine ends. Drifting Home is an account of a journey by Pierre Berton and his family down the Yukon river and through Canadian history. From the Klondike goldrush of 1898, to Berton's own childhood, the book takes us through three generations in what is now Canada's most famous ghost town.. Signed and Dated by Author on Title Page. First Edition. Hard Cover. Near Fine/Good. Illus. by Robert Holmes. 8" x 6". Clear Brodart Covering. 1993-10-01. Good. Ships with Tracking Number! INTERNATIONAL WORLDWIDE Shipping available. May not contain Access Codes or Supplements. May be ex-library. Shipping & Handling by region. Buy with confidence, excellent customer service! Douglas & McIntyre, 2003-03-01. Rep Sub. Paperback. Used:Good. PHILADELPHIA, PA.: J.B. LIPPINCOTT & CO., 1963. STATED FIRST EDITION, SECOND IMPRESSION, UNCLIPPED DJ, OWNER'S BOOKPLATE TO THE FFEP.. 2ND. HARDCOVER. VG/VG. Toronto: McClelland and Stewart Ltd, 1973. First Edition, First Printing. Hardcover. Fine/Very Good. Mustard cloth over boards, title stamped in blind onto upper board, title stamped in gilt onto spine, medium duodecimo, 7-3/4" x 5-3/4", all edges trimmed, headbands, map illustrated endpapers, pp.174 and 24 pages of photos. Faint erasure on front pastedown under DJ front flap, else fine in a very good jacket that shows rubbing, short closed tears and minor creases with some fading to spine. Pierre Berton, his wife and family of seven children, paddle the Yukon river, following the same route as Berton's father took in 1898. Signed and dated Nov. '73 by the author on the half-title page. Toronto: McClelland and Stewart Ltd, 1973. First Edition, First Printing. Hardcover. Near Fine/Good. Mustard cloth over boards, title stamped in blind onto top board, title stamped in gilt onto spine, medium duodecimo, 7-3/4" x 5-3/4", all edges trimmed, headbands, map illustrated endpapers, pp.174 plus 24 pages of photos. Light spotting to text edges, else near fine in a rubbed and worn jacket with a small chip at head of spine. Pierre Berton, his wife and family of seven children, paddle the Yukon river, following the same route as Berton's father took in 1898. Signed, inscribed and dated Nov. '73 by the author on the half-title page. Knopf. Very Good in Very Good dust jacket. 1973. Hardcover. Dust Jacket in Very Good condition. ; 8vo 8" - 9" tall . Toronto: McClelland & Stewart Limited [0-7710-1195-4] 1973, Advance reading copy. (Advance proof) 174pp. Very good. Illustrated map endpapers, black and white and color photographs. A previous owner's name in ink on the front cover. "We begin at the beginning, at Lake Bennett where the Yukon river rises and where, on a perfect June day in 1898, seven thousand hand-made boats of every conceivable structure and design set off under sail, paddle and sweep for the Klondike goldfields on an adventure which my family and I hope to recapture" - from the text. Locale: Canada; Yukon. (Canada, Advance Reading Copy, History, Western Canada). Toronto, Ontario: McClelland and Stewart, 1973. Book. Very Good. Hardcover. Signed by Author(s). Canadian First. Signed and dated Nov '73 on the half-title page by Pierre Berton; some edge wear to boards and dust jacket; otherwise a solid, clean copy with no marking or underlining; collectible condition; dust jacket is protected by a mylar cover; illustrated with both colour and sepia toned photographs; map on endpapers..
McClelland and Stewart. Used - Very Good. Great condition for a used book! Minimal wear. Alfred A. Knopf. Used - Good. Former Library book. Shows some signs of wear, and may have some markings on the inside. McClelland and Stewart. Used - Acceptable. Former Library book. Shows definite wear, and perhaps considerable marking on inside. McClelland and Stewart. Used - Very Good. Ships from Reno, NV. Former Library book. Great condition for a used book! Minimal wear. 100% Money Back Guarantee. Shipped to over one million happy customers. Your purchase benefits world literacy! Toronto: McClelland & Stewart , 1st edition. (Hardcover) 174pp. Very good plus in very good dust jacket. Map endpapers, photographs, illustrations. Locale: Yukon. (Western Canada). McClelland and Stewart, 1973. pp.124 plus color photo album. clean tight copy with slight abrasion top front right corner on frontpiece. First. Hard Cover. Near Fine/Fine. 8vo - over 7¾" - 9¾" tall. NY: Knopf, 1974 fine/near fine. out of print. first ed. Binding is cloth..
New York: Alfred A. Knopf, 1973. Hardcover. Fine/Fine. First am. Fine in fine dustwrapper. Please Note: This book has been transferred to Between the Covers from another database and might not be described to our usual standards. Please inquire for more detailed condition information. New York: Alfred A. Knopf. Very Good+ in Very Good+ dust jacket. 1974. First American Edition. Hardcover. 0394490819 . Rafting down the Yukon with wife and six kids? What was he thinking? A good read and a story that makes your last vacation look downright placid by comparison ; Color Photographs; 12mo; 174 pages . Toronto: McClelland & Stewart, 1973. 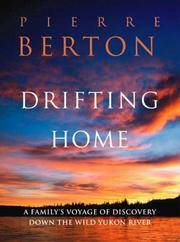 "Drifting Home" is an account of a journey by Pierre Berton and his family down one of the world's last great wild rivers, the Yukon. In it Berton has created a special magic through a unique blending of nostalgia, his deep love of the land, and his unrivalling knowledge of the history of the area. This journey took the family over the Klondike goldrush route of 1898 from Lake Bennet, BC. to Dawson in the Yukon Territory. An album of colour photographs follow page 144. The twenty-four pages of photographs are by Robert Holmes. Yellow-orange boards with gilt title print to spine. Map endpapers. Nameplate to fep and name to prelim. A very nice, bright square copy in a price-intact dust jacket.. First Edition. Hard Cover. Near Fine/Near Fine. New York: Alfred A. Knopf, 1974. Burgundy cloth with gilt lettering. Dust jacket has photo of raft on the Yukon. Map end papers. By raft down the Yukon, with his wife and six children the author retraces the great wilderness route of the 1898 goldrush to the ghost town of Dawson that was his own childhood home.. First American Edition. Cloth. Fine/Fine. Illus. by Jacket Photo By Robert Holmes, Illustrated with 24 Pages of Photographs, 15 Pages in Full Color. 8vo - over 7¾" - 9¾" tall. Toronto: McClelland and Stewart, 1973. First Edition. Hardcover. Very Good/Sl/worn and Chipped. 8vo. Signed by Author. pp. 174, ep maps, color illustrations, SIGNED and inscribed by Berton on the title page. New York: Alfred A. Knopf. Hardcover. 1974. 1st Edition. 8vo 174pp . Fine in Fine DJ. Color Illustrations Neat ink name By raft down the Yukon with his wife and six children, following the Klondike goldrush route of 1898 . McClelland and Stewart. Hardcover. 0771011954 Signed Canadian first edition, first printing. Signed on the title page by author. Published in 1973. Jacket is in Very Good + condition. Minor wear to spine ends and edges of jacket. Jacket is unpriced. Covers are clean and bright. Edges are sharp. No tears or creases. The book itself is in Near Fine condition. The binding is straight and tight. Previous owners name on front end page. NO remainder mark. All books are marked down 35% until February 1, 2019. Start stocking up now! . Very Good. M&S, 1973. Hard Cover. Fair. New York: Alfred A. Knopf, 1974. First American edition. Hardcover. 8vo. Light edgewear incl. some minor loss to bottom corners; very good- in lightly shelfworn, very good- dustjacket with some minor loss to bottom corners. New York: Alfred A. Knopf, 1974. First edition. Hardcover. A non-fiction account of how the author took his wife and seven children on a "fleet" of rubber rafts down the Yukon river. Illustrated with 24 pages of photographs. A very near fine copy in a very near fine price clipped dust jacket. Toronto, Ontario, Canada: McClelland & Stewart, 1973. First Paperback Edition . Paperback. Very Good/No Jacket. 8vo - over 7¾" - 9¾" tall. 24 COLOUR PLATE PHOTOGRAPHS by Robert Holmes. Very good black color pictorial trade paperback. Light wear. 1973, 8vo, 174pp. SPADONI & DONNELLY 2413, "The journey into history took the author, his wife and their seven children over the Klondike gold rush route of 1898 from Lake Bennett, B. C., to Dawson in the Yukon Territory." Douglas & McIntyre. PAPERBACK. 1550549510 *BRAND NEW* Ships Same Day or Next! . New.